Last night the Oakland City Council held its scheduled second reading of a ban on coal handling and storage that was originally approved in late June. It's worth a mention that on the same night, Alameda County's Board of Supervisors voted unanimously to ban fracking: the fifth county in California to to so. Oh, and more ridiculous sh*t went down in Cleveland. The two Oakland measures banning coal were placed on the council’s consent calendar: an ordinance to prohibit storage and handling of coal and coke throughout the city, and a regulation that applies the ordinance specifically to the proposed Oakland Bulk and Oversized Terminal, from which developers were planning to ship coal from Utah and other western states to Asia. The council's single vote on the consent calendar multiple measures was unanimous: 8 ayes, with all council members present. Following more than an hour of citizen and community testimony on a range of issues, the consent calendar was passed in a single vote, no roll call, so quickly that the couple dozen coal activists in the council chambers missed our chance to cheer. Unsurprisingly, Oaklanders filling the chambers, overflow rooms, and hallways didn't seem to regret missing the chance to monitor the Republican Party convention's second evening of crashing and burning, live and simultaneously, in Cleveland. 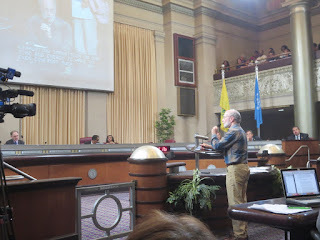 There was plenty of actual governance beyond the coal ban on the agenda: the council was taking testimony on a ballot measure to fundamentally strengthen citizen oversight of it's much-worse-than-problematic police department (the council will vote on 26 July whether to put the measure on the ballot); and two proposals to "sharply limit property owners' ability to raise rents" as protection against displacement driven by the the current tech-bubble economy were passed later that night. The meeting ended around 1:20 a.m.
How does that happen at a local level, in ways that engage hundreds and thousands of unelected citizens in determining the future of their own communities -- in ways that stand a chance of realizing progressive twenty-first century goals, many of which were lent fire and urgency by Bernie Sanders' recent successful run at the presidency (and I mean successful -- by any measure other than winning the Democratic Party nomination)? NCIO attracted people with long histories of political organizing in a wide variety of contexts, who between them had deep and broad knowledge of Oakland politics, successful campaign strategies, environmental justice struggles, legal analysis, environmental science, and more. The group included members who were vehemently anti-establishment and cynical about the possibility of success with the elected council, along with a couple of people who had served as elected city officials. We included at least one Republican and quite a few socialists working together, deeply religious people alongside atheists, and a few folks with histories of past conflict who focused on our shared goal. Our passionate commitment generated mutual respect within the campaign and widespread appreciation for the campaign. But ... go back and follow that link to Robert Reich's post on Bernie's 7 Legacies that I snuck in a couple paragraphs up. I fully acknowledge the urgency of defeating, on November 8th, the jackbooted buffoon who has now hijacked the Republican Party. But "urgent" doesn't mean "only." There's plenty to be done locally (including but not limited to campaigning for progressive candidates in down-ballot races across the U.S.) as The Donald goes down to his rightful place as World's Loudest Loser. And we can succeed locally -- and, eventually, more broadly -- if we attend steadily to the work at hand, without getting derailed by national media spectacle and the likes of Pokémon Go. I'd say that sealing last night's legislative victory keeping coal out of Oakland gave hope to the prospect that we might yet win still bigger contests than a presidential election, so long as we keep our eyes on the prize.